The purpose of this exposure was to test a batch of PPF 400 120 that I purchased a few months ago. The negative frame had nice density and had been properly exposed. The focus, polar alignment and guiding were good. 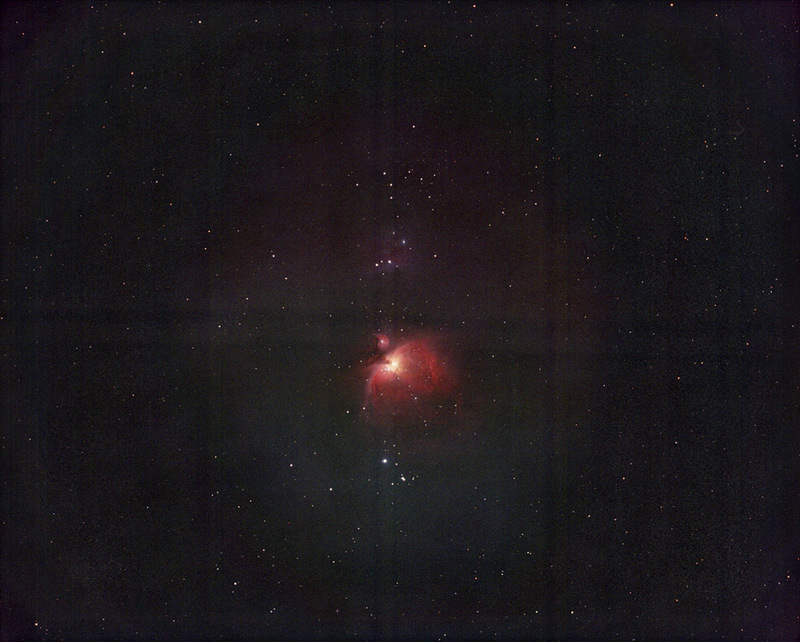 This is not a great image of M42, but considering that the target was positioned directly in the light dome of Boston (five miles away) and there was a seven day old moon 30 degrees away in Taurus, this is not bad. The first thing I noticed were the vertical and horizontal bars throughout the image. These are PowerLook 3000 scanner hardware artifacts. I have been using the scanner to scan astro images for two years, but I have not seen these artifacts before, so I am concerned that the scanner may be failing. I have emailed UMAX for support, but have not yet received a response. As usual, the image was significantly vignetted. I created an anti-vignetting layer (AV) in Photoshop. This image has been stretched quite a bit (deliberately), so some circular color banding artifacts are visible. Aside from the AV, the only processing used for this image were levels and curves. My conclusion about the film: it worked fine. The next step is to try the film at a dark site, without need of a filter.